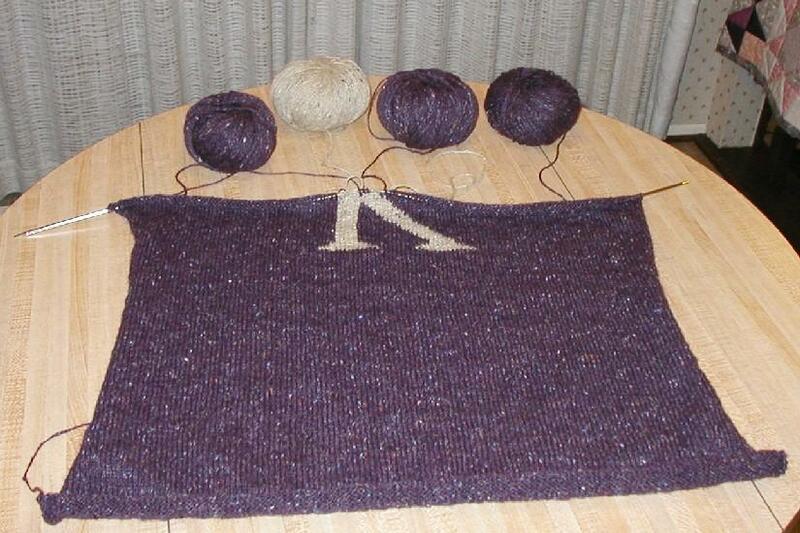 Take a gander at that–it’s the bottom half of a K on the front of my Weasley sweater. 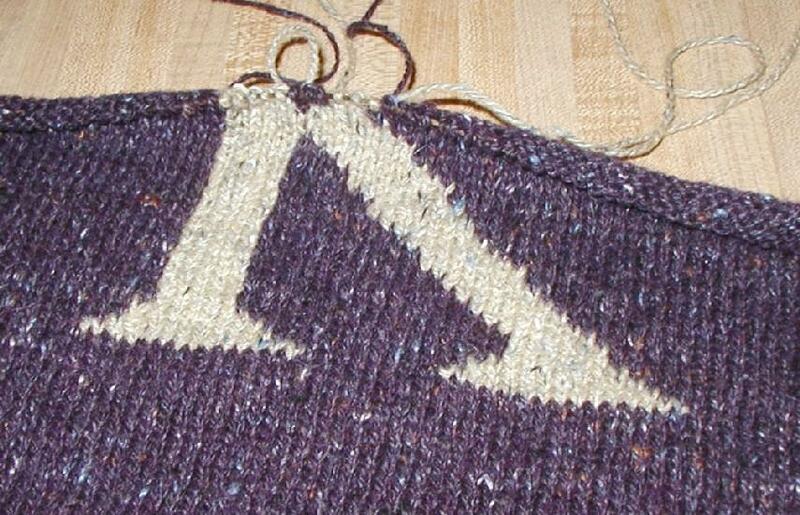 I started the letter part early last week, and so far it’s going pretty well considering I’ve never done intarsia before. For the first few days, I had to check the pictures in Vogue Knitting every time I changed colors to see which yarn needed to go where; now I’ve progressed to just keeping the book near me with a ball band marking the appropriate page for ease of reference. Some of my changes look a little wonky but–say it with me now–it’s a Weasley sweater and it’s not supposed to be perfect. I figure I can always touch it up later with judicious use of duplicate stitch (I say this never having done duplicate stitch, so perhaps I am living in a fool’s paradise). Not that I’m willing to let everything slide, though. 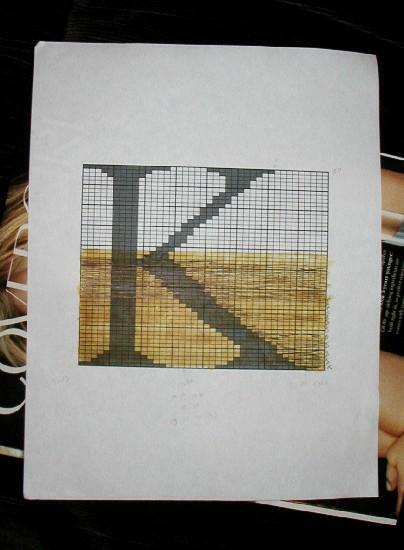 When I got to the section where the slanty part of the K joins the upright part, I noticed that the stitches didn’t line up like they did on the chart. I eventually found my mistake about 10 rows back and much as it pained me to do, I ripped the stitches because I just knew it would bother me if I left them no matter how successfully touched up later. I learned two things in the process. First, it’s important to rip the same number of rows in each of the sections. Somehow I managed to pull out one more row in the middle section of purple than in the others, which meant some tricky work with a crochet hook to restore them. Second, don’t be too quick to weave in the ends. Yes, it’s satisfying to have them done, but if you end up ripping back past the point where you wove the ends it, it’ll be harder than if the ends were still hanging loose. I’m sure there’s a better way to handle the different colors than I’m doing. Working across a knit side row, I first use a ball of bilberry (the purple), then a long piece of corn (the tan) that I can’t get to stay in a nice bobbin even though I’ve studied the pictures in the book, then another ball of bilberry which I joined when the long length of bilberry I was using ran out, then a ball of corn, then another ball of bilberry. So far I’ve avoided terminal tangles, but I can’t just flip the work around and keep going when I get to the end of a row, I have to stop and sort the different strands out. Maybe I should be using long pieces of yarn for all the sections instead of the balls even though that will probably mean more ends to weave in because I have no sense of how much yarn is needed to cover a given area.